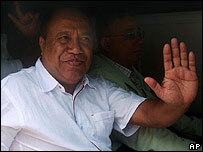 East Timor's former interior minister has gone on trial on charges of arming civilians during unrest last year. Rogerio Lobato is accused of supplying weapons to a rebel leader who says he was hired to act against opponents of the then prime minister Mari Alkatiri. Violence erupted when the dismissal of 600 soldiers by Mr Alkatiri in March triggered street battles between police factions and the army. More than 3,000 Australian peacekeepers were deployed to restore calm. Their numbers have since been reduced to around 1,100. At least 37 people died during the clashes within different factions of the security forces which later sparked ethnic and gang violence. More than 150,000 people fled their homes. Proceedings against Rogerio Lobato and three co-defendants are beginning two months late amid ongoing conflict between rival gangs, in which more than a dozen people have died. Hundreds of Rogerio Lobato's supporters gathered outside the high security courthouse in the capital, Dili, as some 50 UN and local police stood guard. About 35 witnesses from East Timor, Australia, the United States, Portugal and Macau are expected to testify. The four could face a maximum 47-year prison sentence if convicted. Mr Lobato has claimed he was acting on the orders of Mr Alkatiri, a close political ally, who resigned in June. Mr Lobato resigned from his post as interior minister on 1 June after President Xanana Gusmao assumed control of the security forces in a bid to control the violence. East Timor gained independence in 2002 after a period of UN stewardship. It was ruled by Indonesia for 24 years before its people voted overwhelmingly in 1999 in favour of breaking away from Jakarta.